Welcome back loyal readers to this week’s episode of ROH on HDNet. For the first time in a month we’ll see an episode that I wasn’t present for. Oh well, no more face time for me and my son. At least the outcomes of tonight’s matches will be new to me. Let’s get to the action. We start things off with a recap of last week where Austin Aries attacked Delirious after injuring his throat. We see multiple camera angles of Kenny King draping Delirious across the barricade and Aries flying off the tope rope onto him. And that means multiple camera shots of my son and I right next to King. Cool, I made this week’s broadcast too. Every time they show that incident, they’ll show us in the crowd. We’re famous now, we’re a part of ROH history. Okay, maybe I’m getting a little carried away, maybe. Jim Cornette announces a match for tonight between former ROH World Tag Team champions, the Briscoes, and the Dark City Fight Club. The winners will be named number one contenders and they will get the next shot at the champs, the Kings of Wrestling. Wow, they aren’t wasting any time tonight, right to the good stuff. This match starts out as an all out brawl. All four men go outside the ring and are laying into each other. Even when they take the action back into the ring, it’s all power. With these two teams you’re not going to see a lot of technical holds. But there is more than enough high impact moves to keep the fans happy. Like Kory Chavis catching Mark Briscoe leaping off the ring apron and slamming him into the barricade. OUCH! Not to be outdone, Mark returns the favor with a Russian Leg Sweep of Chavis into the turnbuckle. The DCFC go for their Project Mayhem finisher but Jay interferes and Mark gets the inside cradle for the three count. The Briscoes are now number one contenders. I would have liked to see DCFC go over here just to see someone knew in the title picture, but it was a well paced and entertaining match anyway. 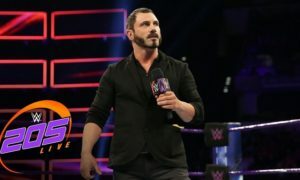 Kyle Durden interviews Austin Aries. Once more we see the attack on Delirious. In black & white, slow motion, with ominous music. You know what, I don’t look half bad in grey. Aries comments on the Pick 6 Battle Royal he will be in later this evening. He goes on and on about how he has studied all the great battle royal winners of the past and now believes that he has the secret to winning against 19 other men. Durden informs him that there are only six in this battle royal, to which Aries replies, “Oh, piece of cake then”. Love that A-Double. We see a recap of the feud between the Necro Butcher and the Embassy. Prince Nana comes out to the ring and announces Shawn Daivari as the newest member of the Embassy. Daivari comes out and shoots on the Necro Butcher. I don’t know about that, I see a lot of chairs and barbed wire in your future Shawn. Kyle Durden interviews Eddie Kingston about the upcoming battle royal. Sorry Eddie, I don’t see you winning this one. But I’ll say that you last longer than Joey Ryan does, how about that. Colt Cabana interviews “The Voice of ROH” Bobby Cruise about the art of talking. Here is the main event of the evening. The winner gets a spot in the Pick 6, which is ROH’s ranking of the top contenders for the ROH World Title. I don’t know about Joey Ryan and Rhett Titus in the same match, that’s a little more sleaze then I can handle. However I am pleased to see Rasche Brown in a real matchup finally. Hey Eddie, remember when I said you’d last longer than Joey Ryan, I lied. That’s because Kingston clotheslines Ryan and himself out of the ring for the double elimination. Now we’re down to four men. Brown displays some nice strength when he picks up Lynn, delivers kicks to Aries and Titus, and then power slams Lynn. Unfortunately for Brown, strength does not equal smarts. While he is trying to eliminate Jerry Lynn he gets dumped over the ropes from behind by Aries and Titus. Now Lynn is outnumbered two to one. Titus gets Lynn up for a power bomb over the ropes but Jerry hangs on (think Rey Mysterio and Randy Orton at the 2006 Royal Rumble) and just like that Rhett Titus is eliminated. But, Lynn is on the apron outside the ropes and Aries flies across the ring and knocks him off for the victory. Afterwards, Aries (all 5′ 9” of him) exits the ring by stepping over the top rope like other great battle royal winners Andre the Giant and Big John Studd. Nice touch. And then to close out the program we see the footage of Aries attacking Delirious last week one more time. Man, that never gets old watching myself on television. Like Terrell Owens said, “I love me some me”. This episode was very entertaining. There were only two matches but they were both very well executed. I’m a big fan of the Royal Rumble so this week’s battle royal was right in my wheelhouse (my apologies Mr. Peck). See you all next week for more exciting Ring of Honor action on HDNet.